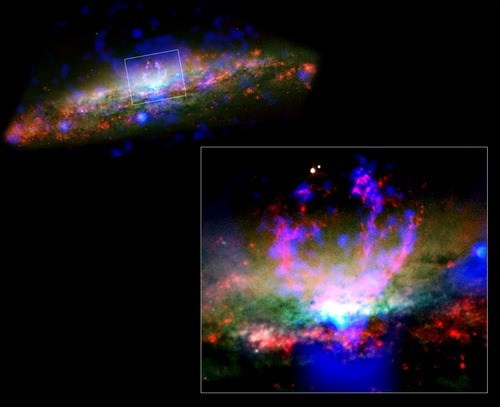 Chandra's X-ray image (blue) combined with Hubble's optical image (red and green) reveal towering filaments of warm (about ten thousand degrees Celsius) and hot (about ten million degrees Celsius) gas that blend to create the bright horseshoe-shaped feature near the center. This feature is thought to have been formed when a superwind of hot gas collided with cold gas in the galactic disk. The full extent of the superwind shows up as a fainter conical cloud of X-ray emission surrounding the filaments. Superwinds originate in the centers of galaxies either from activity generated by supermassive black holes, or by bursts of supernova activity.